Growing up in Pasadena and Monrovia, respectively, Bill and Judy understood and appreciated the benefits of community foundations. In fact, Bill’s father created a donor directed fund through PARAID, an organization that donated to Pasadena causes. Bill himself became a respected leader as CEO of a local non-profit — a position that resulted in him becoming aware of PCF decades ago when it was known simply as the Pasadena Foundation. In the 1970s, Jo Stephens, then Director of the Pasadena Foundation, called Bill to straighten out a mix-up. At the time, Bill was Director at the Pasadena Foundation for Medical Research, an organization that is now the Huntington Medical Research Institutes (HMRI). Jo said: “I have a check here that I’m afraid is yours. I’ll stop by.” The organizations’ similar names often led benefactors to send donations to the wrong group, but on this day, the stakes were high. She gave Bill a $50,000 check made out to the Pasadena Foundation for Medical Research. 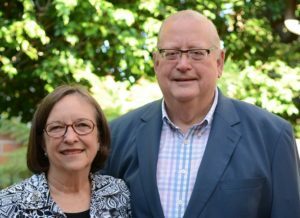 Bill’s early exposure to philanthropy and his 53 years at HMRI helped shape, not only his, but Judy’s approach to volunteerism and giving. Today, they have built an unrestricted endowment at PCF, which supports local grant-making.